Scroll down for dates and details for members submitting work to the Summer Exhibition. Full and student members only. Not a member? find membership details here. Include your name and the artwork title. Be aware that if a large volume of images are sent at any one time, there will be delays before they can all be uploaded. To ensure that your images are uploaded to the gallery before the exhibition, email them no later than Wednesday 3rd July 2019. The organisation of the annual Summer Exhibition is all done by you, the members and committee. Please remember to fill in on the entry form any offer of help you can give to the Exhibition. Every exhibitor is expected to steward a 2 hour session. To book your time slot in advance of handing in your work please contact Janet Blackham. Otherwise you will be asked to fix a date at handing in. Sold catalogued work remains on show until the end of the exhibition, but unframed work may be taken at time of purchase. No replacement of sold work is possible, and unsold work not collected will be stored at a charge of £1 per week. Commission is 20% of work sold at, or in consequence of, this exhibition. This feature has proven very popular, so we again hope to offer all contributing artists to the Exhibition an opportunity to tell visitors about themselves and their work. It will take the form of an A4 looseleaf folder with acetate sleeves. Artists will be in alphabetical order. Each profile must be no larger than A4 size and suitable to slip into an acetate sleeve. It can fill 1 or 2 sides, but must be on separate sheets, and can include pictures and words. Your 2 separate sheets will be displayed opposite each other to make a spread format. If you wish to participate in this idea, please bring your profile on the ‘handing-in’ day, to be added to the file. 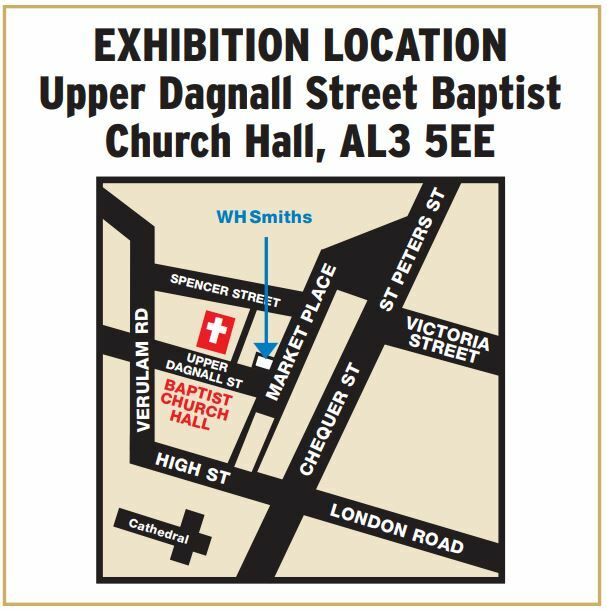 Between 10am and 2pm only, there is step free access to the main area of Dagnall Street Baptist Church Hall via the lift in the Cross Street Café (adjacent to the Church Hall). TERRY BIGGS CUP for the work judged to be the best in the exhibition. The work selected for this award will be chosen by the visiting public. CHALLENGE TROPHY for the work judged to show most freshness of vision and originality. ST ALBANS TROPHY for the work judged to best capture the distinctive character of St Albans in an original way.